Welcome to the Custer YMCA! Where we are more than just a gym! 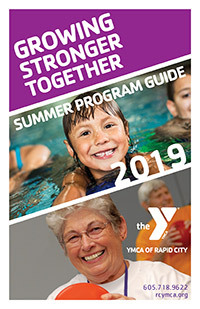 You may know the Y for our pools, classes, gyms, basketball courts or summer camps, but in Custer the Y is so much more. Our purpose is to serve the Custer area through programs that provide a positive, safe and supported environment and through the development of the basic core values: Honesty, Respect, Responsibility and Caring. The mission of the Custer YMCA is "To put Christian principles into practice through programs that build a healthy spirit, mind and body for all". Children and teens play, learn who they are and what they can achieve. We believe everyone deserves a Y, so the Custer YMCA offers financial assistance to individuals and families who might otherwise not be able to afford membership or program fees. Ask a staff member about financial assistance. It’s easy to apply and the Y does everything it can to make the Y a place for all. We have a lot to offer you! Click any of the links above to learn more. We invite you to join the Custer Y and become part of a community committed to helping you and your kids learn, grow and thrive. We encourage prospective members to come by and take a tour of the YMCA and see what we have to offer. For more information, contact the YMCA office at 605.673.5134. And you can be involved! Help us make the Custer YMCA stronger as we reach people of all ages and all backgrounds in every corner. When you volunteer or give, you’re building a stronger Custer community. As a nonprofit, the Y is able to strengthen community because of the dedicated youth, families and individuals who share our passion and make the Y part of their lives. They give their time, resources and talents—every day and in hundreds of ways—because they know they can improve the lives of others while enhancing their own through the Y. Well-being for many of our neighbors is all too frequently limited by income or social isolation. Within the Custer community, the Y offers opportunities for every child, teen or adult to achieve his or her potential regardless of economic status. With your help, the Y can continue to expand programming and outreach where it is needed most. Please consider volunteering your time, making a contribution, or sharing your story of the Y’s impact.